While Celluloid Cinema takes pride in providing deep film and television analysis each week for our audience to enjoy and discuss, sometimes it’s easy to get wrapped up in the fictional worlds we enjoy through these mediums and lose touch with the own issues that are plaguing our society. Luckily for us, every so often there comes a film or show that uses its platform to makes us question our own society. Recently, ABC’s hit show Blackish, which is known for addressing controversial race issues, filled this void with a recent episode titled “Hope” which was centered on the growing epidemic that is police brutality against black individuals. The show quickly introduces the subject in the opening segment, and uses the rest of the episode to discuss differing prominent viewpoints that typically surround police brutality before settling down before returning to equilibrium and deciding on a concrete viewpoint. The entirety of the episode follows a pretty straightforward arc and only takes place in the Johnson house, which is where the main character Dre and his family live. However the episode primarily deals with not one main aspect of police brutality but two different aspects. The two aspects that the family debates throughout the course of the episode are, how to discuss the topic with children in the proper way and how can individuals stand up against police brutality. This first issue of determining how to expose children to the idea of police brutality is explored through dialogue between Dre and his wife, Rainbow. Through their conversation early on in the episode Dre recounts his experience with learning things as a child with how his parents would just outright explain to him difficult things in the world without any filter what so ever. In contrast, the audience is given the other side of the argument by Rainbow who is concerned that explaining police brutality to her children will either be too difficult for them to understand or rob them of their innocence. When their argument commences several minutes into the show there is not any real resolution that the couple comes to. Since the couple does not come to a resolution, the conversation serves more as an informational outlet allowing the audience to pick which view they identify with since the show does not condemn one more than the other. However, it becomes apparent those involved with the making of Blackish are not there to provide an outlet for the issue to be discussed, instead their goal is to inflict a clear cut belief on the audience. To obtain this goal mid way through the episode the children end up overhearing the family’s discussion on police brutality forcing the plot to move forward. In the following scenes each parent attempts their method of explaining the situation to their children, with Dre telling the children that police shoot children and with Rainbow trying to sugarcoat the situation by explaining not all police are bad. As a result of these dual viewpoints on the subject the children waffle back and forth between fear and confusion. This display of negative emotions clearly outlines to the audience that neither outlook is the proper approach to teaching police brutality. It is not until Dre’s mother, Ruby, introduces a third viewpoint of addressing the officers with the upmost respect, fear, and courtesy that the children seem to understand the situation. By having Ruby’s viewpoint be the reason that the show is able to return back to equilibrium it is made apparent to the audience Ruby’s viewpoint is the right approach to educating the children. While the show promotes the idea that black families should educate their children about how to behave around racist police officers, this same idea also promotes the idea of remaining subservient and surrendering your rights. This is why the episode again goes back into disequilibrium giving the characters the stage to discuss how individuals can combat police brutality. In the latter third of the episode, Dre’s oldest son Junior contemplates the idea of leaving the house and joining protesters who are outraged about a police officer not being indicted for police brutality. Again, polarizing views are brought into contrast between one another, except this time Dre and Rainbow are on the same page and it is Dre’s father, Pops that is part of the opposition. While Dre and Rainbow discuss their concerns about the violence that may occur to Junior as a result of protesting, Pops condemns Dre for acting as if he is above protecting black rights now that he has achieved some level of success in his life. Again while the audience was able to sympathize with the concerns of Dre and Rainbow initially, alternative readings of the episode are completely negated once Dre comes to the realization of what Pops is saying. This realization prompts Dre to deliver a sorrowful monologue over images of President Obama’s inauguration where he brings up how those of color cannot sit quietly and allow other forces to overpower their voice. As a result, the family decides to show solidarity and join the protests. This resolution puts the family into a perfect equilibrium thereby enforcing to the audience that the conclusions the Johnson family comes to is the perfect approach to the situation. Even though the episode started out in clear disequilibrium about how to openly discuss police brutality with young ones, the episode effectively explores different approaches one could take to the situation and in doing so was able to shut out all but one in order to prove why a particular approach was the best. Yet, this particular idea of cowering down to undeserving police officers only furthers the abuse they project, so in order to combat this issue the episode reentered disequilibrium as the character struggled to find their place in bringing an end to police brutality. Once again, through the method of allowing each individual character to articulate their viewpoint the show returned to equilibrium once the family decided that in order to combat police brutality they must not go quietly into the night. Thank you for visiting Celluloid Cinema. Please leave your response in the polls and comments below. 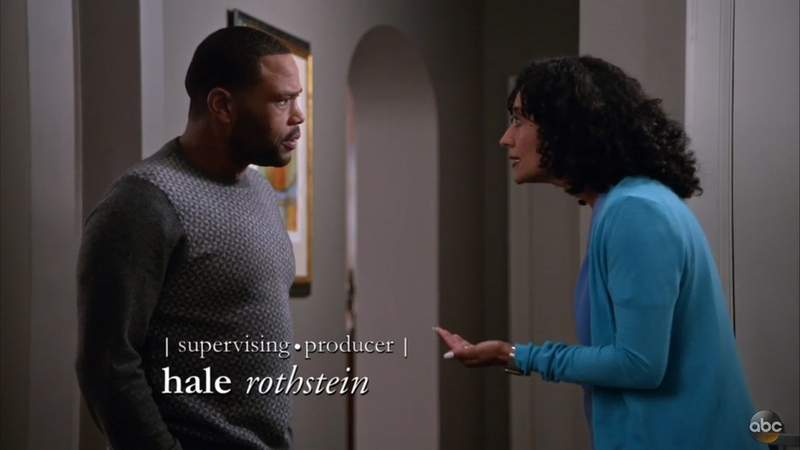 Does Blackish make meaningful strides to help end police brutality?